While we are definitely amateurs learning photography as we go, we are often asked what digital camera we use for our photos. We recently upgraded to the Canon Powershot S95 Digital Camera. This 10MPixel Digital Camera with 3.8x Wide Angle Optical Image Stabilized Zoom has an excellent f2 lens which allow it to take excellent low light pictures. This model ads 720p HD video, HDR mode, and faster focusing over the already excellent Canon Powershot S90. We prefer to maintain a low profile while take photos, making a huge digital SLR camera a no-no. Using a flash is also not desired. Flash photography disturbs the entire restaurant and results in unnatural results. 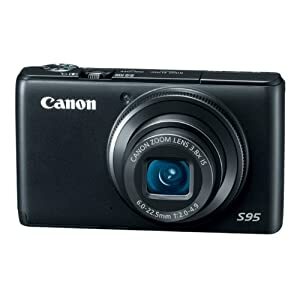 The Canon Powershot S95 fits in pocket an allow us to quickly snap good looking photos. The 28mm wide angle lens lets it capture large panoramic venues. The camera has full manual controls allowing us to optimize settings to a particular situation. Downsides.. This camera is not cheap, it is not a speed demon, and it does not have a 1080p HD movie mode. Try to position the camera low to achieve a more level picture. This avoid a bird’s eye perspective. Quickly take a picture or two and enjoy the food! Put the camera away when it is not in use. Well, this camera looks really cool and I think this is great to be used by beginners. Nice product from Canon. The Canon S90 is a very good choice for the reasons you mentioned. Another good choice is the Panasonic Lumix LX3 which has many of the same features as the Canon, including the fast f2.0 lens but has an even wider field of view. I believe it is in the same price range as the Canon. I do believe the Canon is phyically a little smaller than the Panasonic. There is also the new Panasonic Lumix DMC-ZS7 12.1 MP Digital Camera with 12x Optical Image Stabilized Zoom and 3.0-Inch LCD (Black) and GPS! The new Panasonic DMC-LX5 is a similar high-end point-and-shoot camera that rivals the Canon S95. I’m curious how the new ILC cameras like the Panasonic GH2 compare to these point-and-shoot Digital cameras. Is there also a sony camera which you could use? Sony DSC-WX5/B with its 3D Sweep Panorama, Exmor R CMOS Sensor is a close one. I also have a NIKON D3000 with a AF-S NIKKOR 55-200mm Lens and a standard 18-55mm lens. Are these also usable for foodphotography?